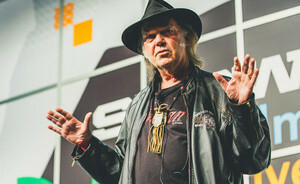 I am a fan of Neil Young's music and have many of his albums. He has launched an initiative to make a portable music player that would play music at significantly better than CD quality and at a quality of the studio master recordings. This was his response to the "dumbing" down of music sound quality by devices like the Sony Walkman and later the Apple i-Pod which used compressed sound quality to reduce file sizes and maximise storage requirements. His initiative launched the Pono player [ here ] in the USA in February 2015 together with the Pono Musicstore selling digital downloads, and this service will launch in other countries soon. It should be noted that services like Spotify (of which I have little experience) xurrently continue this trend with sub-CD quality. The CD technology is now over 30 years old and current technology enables a quantum leap forward rather than regression into sub-standard sound quality. The future of the CD has been called into question by the development of digital music downloads and the re-emergence of vinyl. This inspired me to plan for the future and convert my music to a digital music format. My objective however was for improved sound quality, not the "dumbed-down" variety, that would be playable on my home sound system, I had little interest in a portable player. This is my story of the steps that I took to achieve this outcome. This my experience to-date in converting my music library to a digital format and planning to move it forward to higher quality audio for the future. It took me around three solid weeks working at it day and evening and it will take you significantly longer on a more part-time basis. The idea behind this guide was to explain what I did, how I did it and the outcome I acheived which I hope will be useful to others contemplating the same journey. This is the story of what I acheived in around three weeks. For many years I have been a hi-fi enthusiast and keen to be able to play my music to the highest standard that I was able to afford. My music is the popular variety mainly rock and blues but the needs for other genres such as jazz or classical would be the same. Over the years I have migrated my sound system to Naim pre-amp and power amps with a Linn Mimik CD player and Celestion and Spendor speakers. I also have a Nachamichi cassette deck and a turntable both of which have been unused for many years. I have around 600 CDs which has been the current media for listenening to music. I have my TV wired into my sound system so all programmes (whether it be news, football, drama) always come through the sound system. A Blu-ray/DVD unit is also connected to the television to enable video to be played back in the same manner. The main objective of my "project" was to convert my music library to a digital format and to be able to play my music through my sound system to an acceptable sound quality. I wanted it to be future proofed to enable me to down-load and incorporate higher quality digital music than CD quality at a future date. Additionally by using a home network it would enable the music to be streamed to other parts of the house and to other devices albeit at a reduced quality than the core system but appropriate to what these additional devices could sustain. As the owner of an excellent Linn CD player (Linn have now discontinued sales of CD players) and as Linn are a supplier of high quality digital music systems I attended one of the Liinn events in the UK (they are also held in locations around the world) to investigate digital-based audio. Control unit apps to select the music. In three weeks I have converted my library of music from CDs to a digital format that I can play thdrough my existing sound system, and assitionally on a eange of devices. You can follow the jounry and steps I took to acieve this goal. My digital music ripped from CDs sounds better than the CDs !